Georgia Tech ROTC promised an Air Force commission, but cuts after Vietnam caused a change in plans. “I wear glasses, and being a pilot was not on the radar at all,” explains Dr. Berry. “They were not interested in additional engineering officers in my year-group. I wandered down the street and joined the Army ROTC program. Through the CAP, I met a Vietnam veteran [electrical engineering] student, Ron Bradford, who inspired a number of us to become career Army officers. “My intention at that time was to take the most difficult assignments I could possibly find. When it came to the summer camp phase of the ROTC program, I volunteered to take the infantry school’s Ranger course – that’s several notches above normal.” John Berry received his bachelor’s degree in aeronautical engineering from Georgia Tech in 1974, and with a commission in the Signal Corps, a Ranger badge, and parachutist’s wings, joined the 82nd Airborne Division at Fort Bragg. AED was also interested in aircraft Health and Usage Monitoring Systems (HUMS). Dr. Berry recalls, “I just learned a lot from Sam. One of the things that he wanted me to work on was a Congressionally-funded program aimed at our ability to reduce principal vibrations on helicopters. If you don’t track and balance your rotor system to reduce your one-per-rev vibrations, you’ll shake like crazy, no matter what you do.” The Vibration Management Enhancement Program (VMEP) built a small, airworthy signal processor that replaced the Aviation Vibration Analyzer that first used modern signal processing methodology to reduce helicopter vibration. AMRDEC, and Aviation Engineering Directorate (AED) chief Dr. Bill Lewis, subsequently assigned Dr. Berry to identify possible technology collaborations at the International Technology Center Atlantic in London. 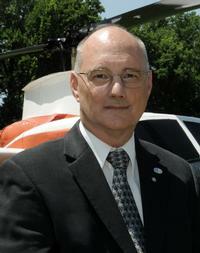 “I was acting as an agent for all of the AMRDEC researchers, both missile and aviation. The idea was for us to initiate the conversation – identify a technology; identify a researcher; give it an initial assessment; and pass that back to our principal researchers in our laboratories.” For example, Army and Air Force researchers worked with the Czech Technical University in Prague on software modules or intelligent agents used for airspace de-confliction. A homecoming assignment back at NASA Langley in the Joint Research Program Office of the AMRDEC Aeroflightdynamics Directorate Research Center put Dr. Berry in charge of teams working on drag reduction. The office completed a major drag study for the OH-58F Kiowa Warrior Cockpit and Sensor Upgrade (CASUP) using a high fidelity, 37% scale model of the helicopter with all external stores and components in the NASA wind tunnel. “The aerodynamic flows of real helicopter configurations are much better understood today than in the past,” observes Dr. Berry. “However, first flight of any new configuration still brings surprises.” The Langley team also investigated innovative drag reduction techniques.” What look like very smooth, rounded, aft-facing parts of a fuselage really create a very large bluff and unsteady shedding if you don’t control the shedding. We found we could reduce the drag by 50 to 75% just by tickling the boundary layer and creating a separation where we wanted it, when we wanted it.” The Army/NASA/Bell Helicopter “Aerodynamics Improvement Team” was awarded AHS International’s 2013 Grover E. Bell Award for their groundbreaking research on the OH-58. In his current assignment at AATD, Dr. Berry remains active in AHS. “I joined AHS when I was in grad school in 1977,” notes Dr. Berry. “It’s a technical community almost like a family because of the relationships you build. Even though I lean toward the key aeromechanics areas which I would call very rotorcraft-centric technologies, the society is much broader than that. It looks at all of the areas that impact the development and operation of rotorcraft.” As a case in point, Dr. Berry is supporting the planned Helicopter Military Operations Technology (HELMOT) specialists’ meeting this October, which is sponsored by the local AHS Hampton Roads Chapter.